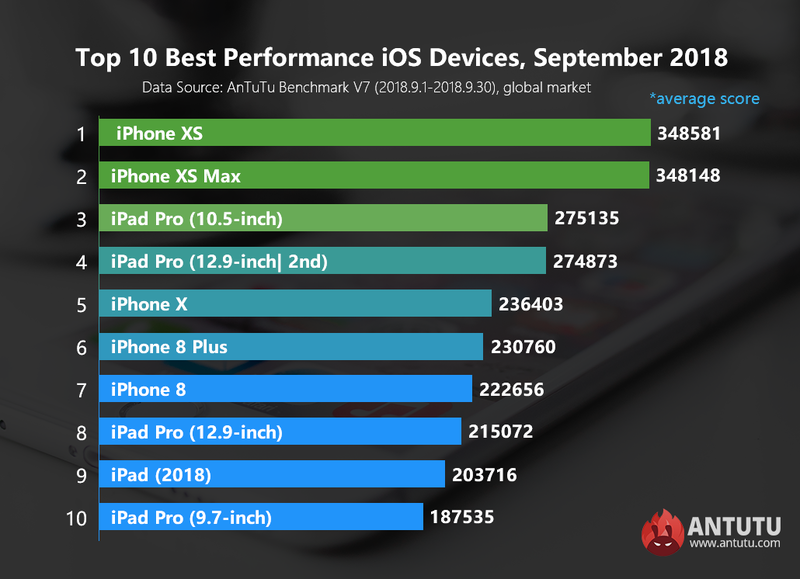 Today, it’s time for Antutu to reveal our most updated benchmark results for Top 10 best performance iOS devices for September 2018. With the release of iPhone XS and iPhone XS Max, there are some new entries to the iOS ranking list this month. How is the performance of these new entries? Check out our most updated top 10 ranking list as measured by the average Antutu score. 2. Period of data collection: September 1, 2018 to September 30, 2018. 3. Data amount: at least 1000 units. In September, iPhone XS and iPhone XS Max unsurprisingly take the first and second spots with an average Antutu score of 348,581 and 348,148 points respectively. The performance of these two new iPhone models has been dramatically improved over the last- generation iPhone products thanks to the new Apple A12 Bionic processor in them. Apple A12 Bionic is an update to its predecessor A11 Bionic and is claimed to be the industry’s first ever 7nm chip. It features an Apple-designed six-core CPU, paired with an Apple designed four-core GPU. With respect to performance, Apple A12 Bionic has two performance cores which are claimed to be up to 15% faster and 40% more energy-efficient than the Apple A11 Bionic and four efficiency cores which are claimed to use up to 50% less power than the energy-efficient cores in the A11 Bionic, and a four-core GPU that is claimed to be 50% faster graphics performance than the Apple A11 Bionic. And ultimately its strong performance is justified by Antutu score. In particular, the GPU performance of Apple A12 Bionic has been significantly improved compare to Apple A11 Bionic. Coming in third is the 10.5-inch iPad Pro which gets an average Antutu score of 275,135 points. This model is powered by Apple A10X processor. With the release of A12 Bionic processor, Apple A10X finally ends its days of constantly occupying the top spot of the iOS list. Making up the rest of this month's Top 10 are the second-generation 12.9-inch iPad Pro, iPhone X, iPhone 8 Plus, iPhone 8, first-generation 12.9-inch iPad Pro, iPad 2018 and 9.7-inch iPad Pro. In general, the most obvious change in this month’s Top 10 ranking compared to last month is that iPhone XS series entered and conquer the top two spots on the list, squeezing the iPhone 7 series powered by A10 processor out of the Top 10. In October, iPhone XR powered by the A12 processor will officially go on sale, and is expected to enter the top three of next month’s Top 10 ranking. Let’s stay tuned.